Checkpoint and Trivia Tuesday: Grayling to Eagle Island – Why do mushers put coats on their dogs? It is time to say good-bye to our young students of Grayling and head up the Yukon river to Eagle Island. This leg of our journey will be approximately 62 miles and will take mushers between 6-9 hours to complete. This section of the trail can be pretty wretched with the blustery wind and bitter temperatures. With the wind, temperatures can drop as low as 40 below zero. This section of the trail is virtually nothing but river, wide open frozen river. It will be very peaceful and quiet, to the point of being almost boring, except for the sound of the talkative trees and the beauty of the night sky. It is very critical for the mushers to stay on the marked trail as there are big sections of open water and thin ice. Another danger mushers may encounter is overflow from the side streams and possibly the river itself. Eagle Island is a very remote checkpoint. The checkpoint is below Ken Chase’s summer fishing cabin. Ken is an Iditarod veteran who has volunteered the use of his land as a checkpoint. The checkpoint itself is actually a weatherport tent and facilities are minimal. Eagle Island was settled in 1975 when the family of Ralph Conaster arrived at this spot on the Yukon River. Their way of life was commercial fishing and trapping. The checkpoint at Eagle Island used to be Ralph’s large cabin until it burned down. That’s when the checkpoint started using the large tent on Ken Chase’s land. Try to think of a luxurious tent, if you would like to call it that. The tent is heated and there is straw for the mushers and volunteers to sleep on. Earlier I mentioned this section of the trail can be very windy. With this in mind it will be important for mushers to dress properly for this section to stay protected from the elements, especially their face. The dogs will need to be dressed properly as well. Coats, t-shirts, and fleeces are among the gear the dogs will need. Watch this video clip of Aliy Zirkle explaining how she gears up her dogs. When the mushers leave Eagle Island they will journey north about 60 miles to Kaltag. 346 miles to Nome! Next stop, Kaltag. Why do mushers put coats on their dogs? Why do mushers put t-shirts on their dogs? Why do some dogs wear coats and others do not? List all the gear you would wear if the temperature was -45 degrees Fahrenheit. Several Iditarod mushers are currently running the Yukon Quest (another 1000 mile race) this week. Compare and contrast the rules of each race. 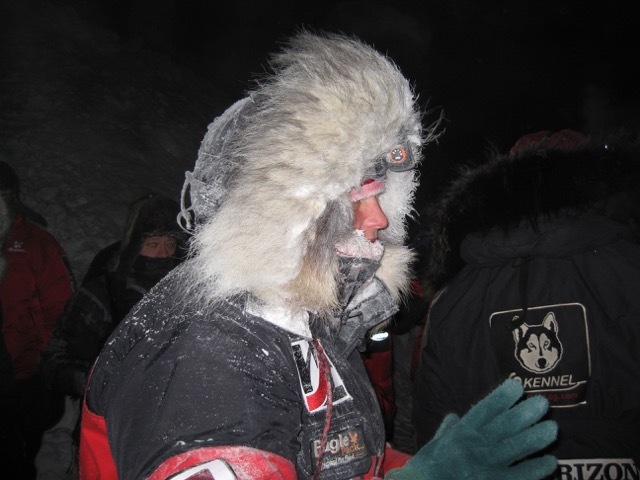 Which 2015 Iditarod mushers are racing the Yukon Quest?